Today, in 2013, we face an unavoidably radical future. 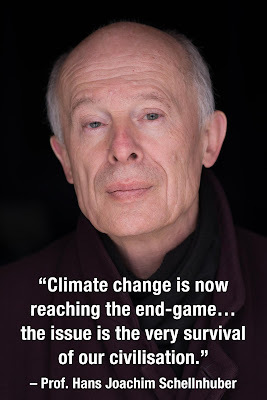 We either continue with rising emissions and reap the radical repercussions of severe climate change, or we acknowledge that we have a choice and pursue radical emission reductions: No longer is there a non-radical option. Moreover, low-carbon supply technologies cannot deliver the necessary rate of emission reductions – they need to be complemented with rapid, deep and early reductions in energy consumption – the rationale for this conference. 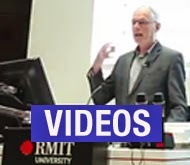 …while the rhetoric of policy is to reduce emissions in line with avoiding dangerous climate change, most policy advice is to accept a high probability of extremely dangerous climate change rather than propose radical and immediate emission reductions. It is in this rapidly evolving context that the science underpinning climate change is being conducted and its findings communicated. This is an opportunity that should and must be grasped. Liberate the science from the economics, finance and astrology, stand by the conclusions however uncomfortable. But this is still not enough. In an increasingly interconnected world where the whole — the system — is often far removed from the sum of its parts, we need to be less afraid of making academic judgements. Not unsubstantiated opinions and prejudice, but applying a mix of academic rigour, courage and humility to bring new and interdisciplinary insights into the emerging era. Leave the market economists to fight among themselves over the right price of carbon — let them relive their groundhog day if they wish. The world is moving on and we need to have the audacity to think differently and conceive of alternative futures. 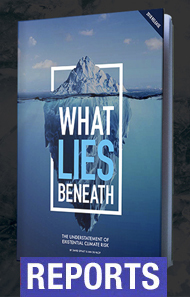 Their writings which underpin the conference's rationale, include: A new paradigm for climate change, Beyond ‘dangerous’ climate change: emission scenarios for a new world, and Reframing the climate change challenge in light of post-2000 emission trends. More recently, Anderson's Avoiding dangerous climate change demands de-growth strategies from wealthier nations more explicitly lays out some of the key assumptions. 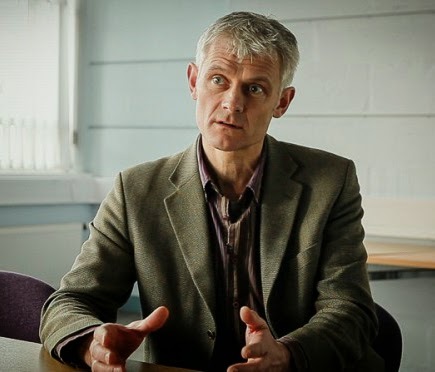 So to the conference itself, and many thanks to Shane White for wading through the conference videos and taking extensive notes which form the basis of these blogs. Anderson's presentation was entitled "'Avoiding dangerous climate change’: Why we need radical reductions in emissions", and it kicked off the conference. The video is here plus slides. Anderson makes the point that radical mitigation has economic benefits, not financial. He says it is time to wrestle economics away form the financiers. The word economics originates from the Greek oikonimia, meaning stewardship of the household; no mention of money. The word financial comes from the Greek chrematistic meaning the making of money. If making money is our priority then 2°C is not viable. If we’re interested in the wellbeing of our lives and the planet, then 2°C is viable with a successful economy. Atmospheric carbon dioxide levels are higher than during past 800 thousand years. The world says it is still committed to make a fair contribution “To hold the increase in global temperature below 2°C, and take action to meet this objective consistent with science and on the basis of equity”. (Copenhagen Accord 2009). So why do we need to concentrate on energy demand rather than supply? 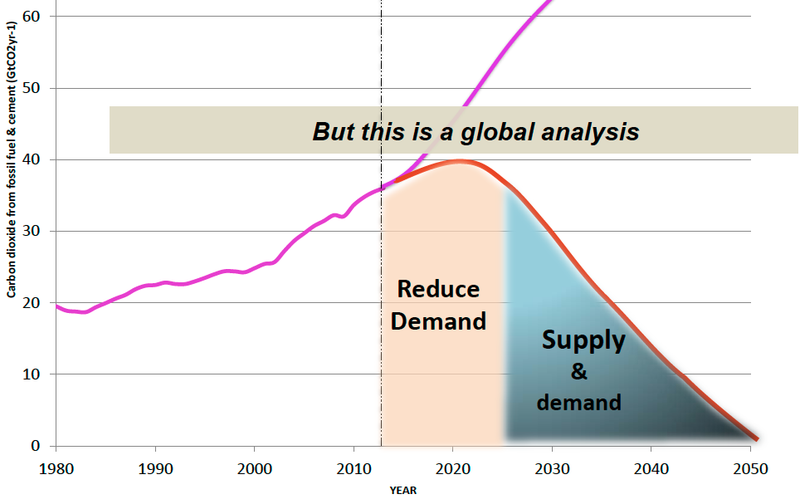 Because, says Anderson, in 2013 it’s too late to only rely solely on the supply side. We need to focus on the demand side now too. So what of future emissions? Everything built today based on fossil fuels is locking ourselves into a high carbon future: power stations, large scale infrastructures, built environment, aircraft and ships. All this infrastructure will be in place for 30 to 100 years. Emissions in the above chart are higher than emissions in IPCC’s highest emission pathway (RCP8.5), with 2% a year growth from 2020. 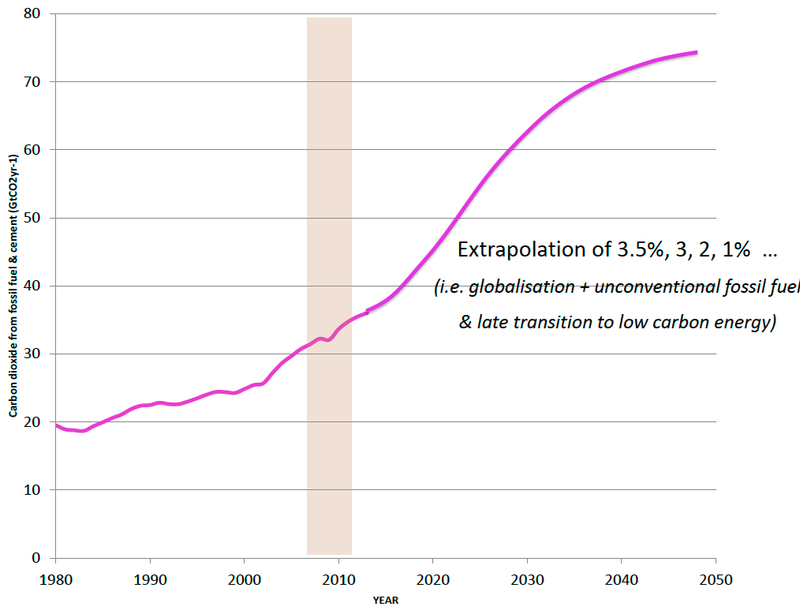 Are such rising emissions scenarios realistic? They are certainly viable, says Anderson, since UK is considered a leading country on climate change and the UK has made extensive fossil fuel investments. Current pathway leads to emissions of greater than 2500 GtCO2 for the period 2000–2050, and 5000 GtCO2 for 2000–2100. 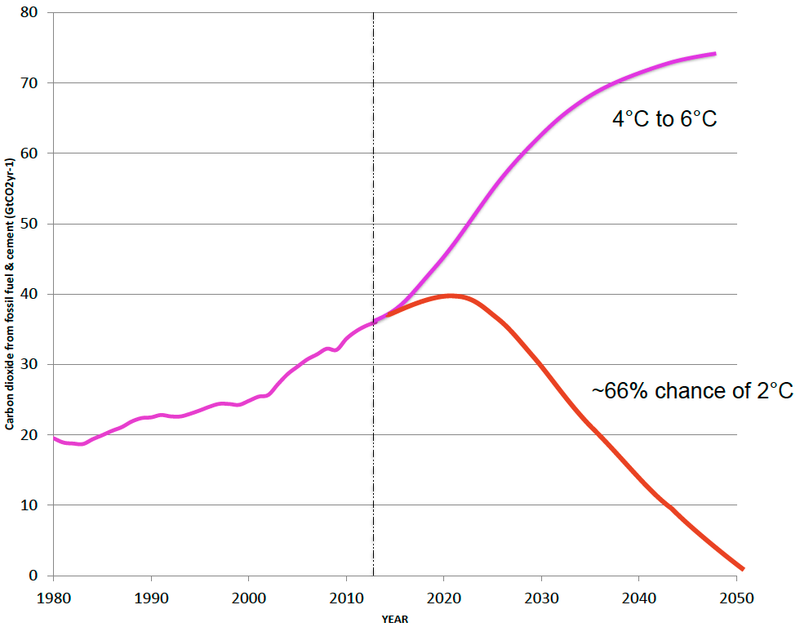 Yet for a 66% chance of less than 2°C, we can emit only 1000 GtCO2. Along our current pathway all of that will be emitted by 2032. There is nothing left for emissions by 2032. The carbon dioxide trend, says Anderson, is “perfectly in line with a temperature increase of 6°C, which would have devastating consequences for the planet” as IEA chief economist Faith Birol has noted. Whether it is 4, 5 or 6°C doesn’t mean too much; they’re all devastating. There is nothing we can do significantly in the wealthy parts of the world to get emissions down with just low carbon supply in the short term. The only thing we can do now is reduce our demand. The supply side is a pre-requisite in the long term to holding temperature below 2°C. This analysis is global. But premised on the basis of equity, poor countries shouldn’t be forced to suffer by reducing their emissions demand by the same rate as us in the short term. So let’s assume non-Annex 1 nations (developing nations) collectively peak their emissions by 2025 (which a a big ask) and reduce emissions thereafter by 6 to 8% per year. Then what emissions budget is left for the rich, developed Annex 1 nations? The answer is that Annex 1 nations require at least a 10% reduction in emissions year on year (this is based on analysis a few years old so 10% is a bit low now). That means a 40% reduction by 2018 (c.f 1990), 70% reduction by 2024, and 90% by 2030 (remembering that these these are radical emission reductions but provide a 66% chance of less than 2°C. Asks Anderson: Is above viable? Is 4, 5 or 6°C a better option? No. 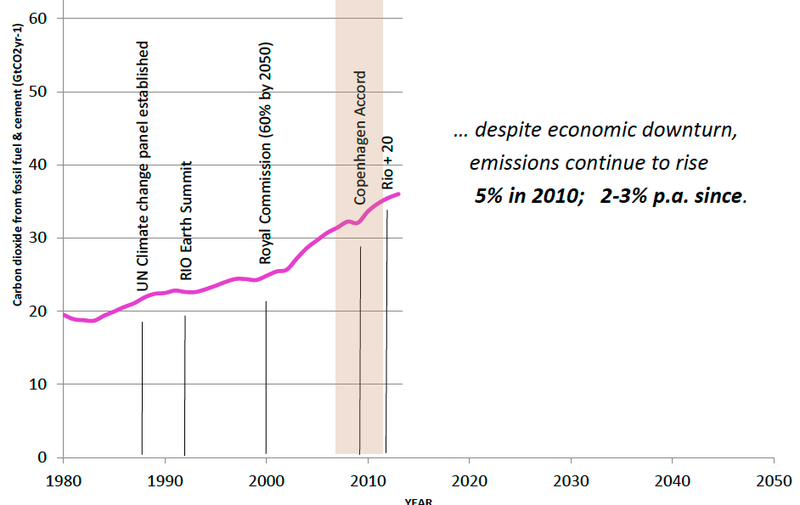 Equity: Small group of people make radical and early reductions (40-60% of emissions are from 1-5% of the population) i.e. those in Annex 1 countries. Growth: There are alternative measures of a good life. Above a certain threshold GDP is a poor proxy for welfare. Radical reductions in energy demand from now to ~2030. Radical reductions in energy demand over one decade are possible if carefully planned. This extends the window to get the low carbon energy supply in place. A Marshall plan to build 100% low carbon energy supply by 2030–2040. Anderson concluded by quoting Robert Unger that“at every level the greatest obstacle to transforming the world is that we lack the clarity and imagination to conceive that it could be different.” He said the paradigm he had outlined will be dismissed as not being practical, but 4, 5 or 6°C is impractical and certainly not equitable.